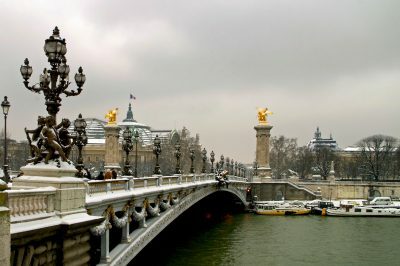 One place in Paris where you aren’t likely to see as many tourists wandering around? 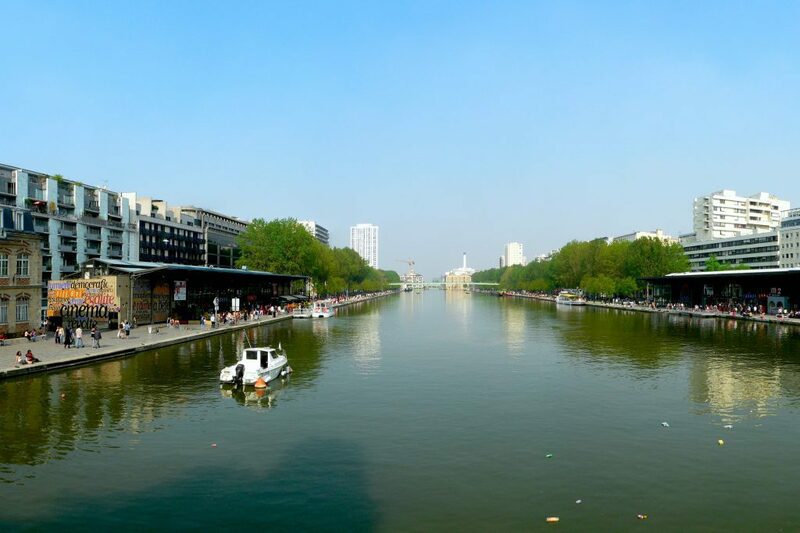 The sprawling, quirky, modern complex in the far northeast known as the Parc de la Villette. Most people never even hear about it. 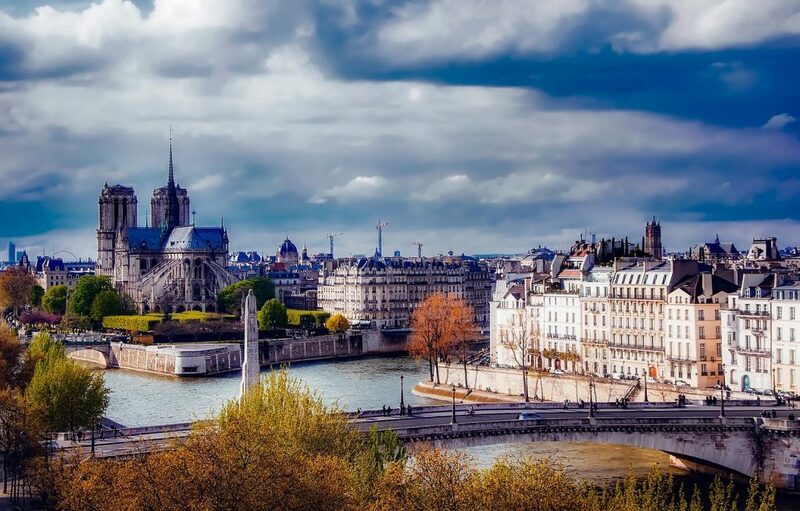 While some guidebooks mention it as a good place to keep kids entertained, it usually doesn’t register as a “major attraction”– especially since it’s not in especially close reach of central Paris. 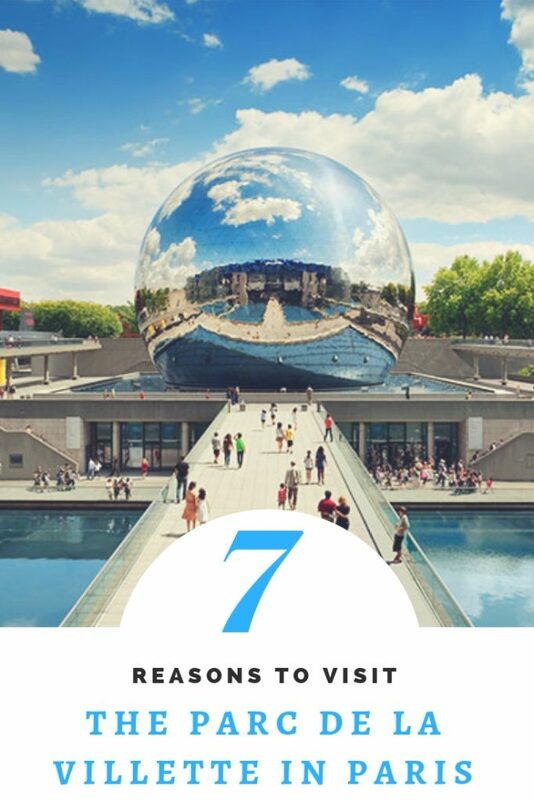 Without further ado, here are 7 good reasons to visit. Booking a Trip to Paris? 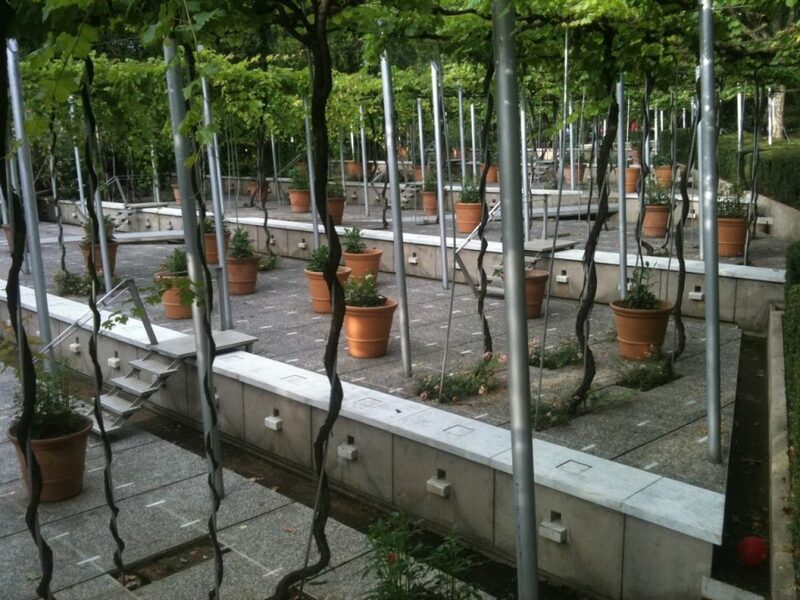 Anyone interested in botany, ecology, or simply whimsical gardening techniques will be inspired and intrigued by the 12 thematic gardens that grace the enormous grounds at La Villette. There’s the “island garden” that makes interesting use of the Canal de l’Ourq running through the park. And a moving installation called the Artery, a tribute to lives lost to HIV and composed of some 16,000 ceramic tiles. 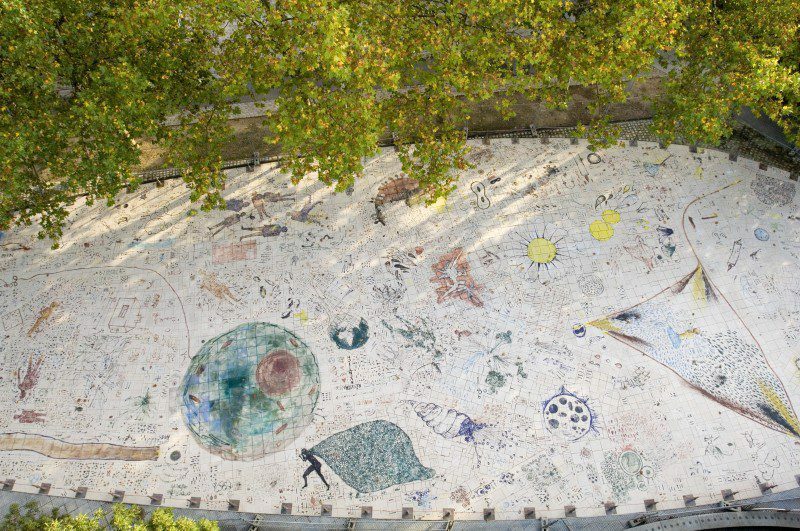 Inaugurated in 2006, it’s the work of French artist Francis Hyber. 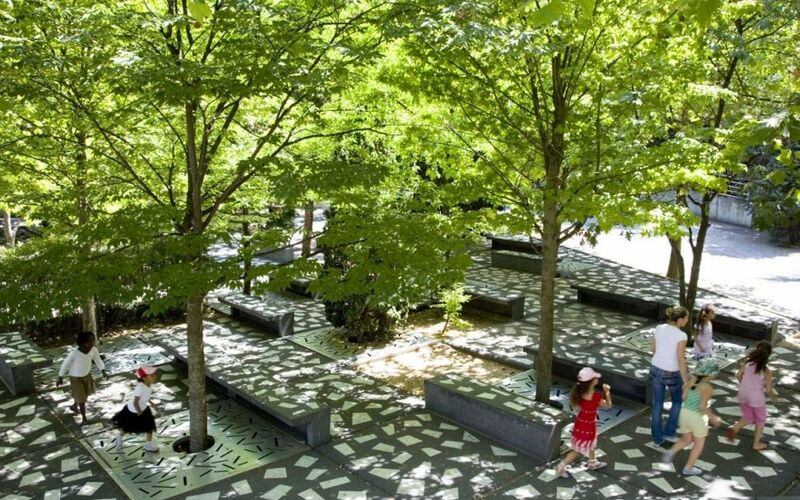 “Artery”, an installation at la Villette by French artist Francis Hyber. 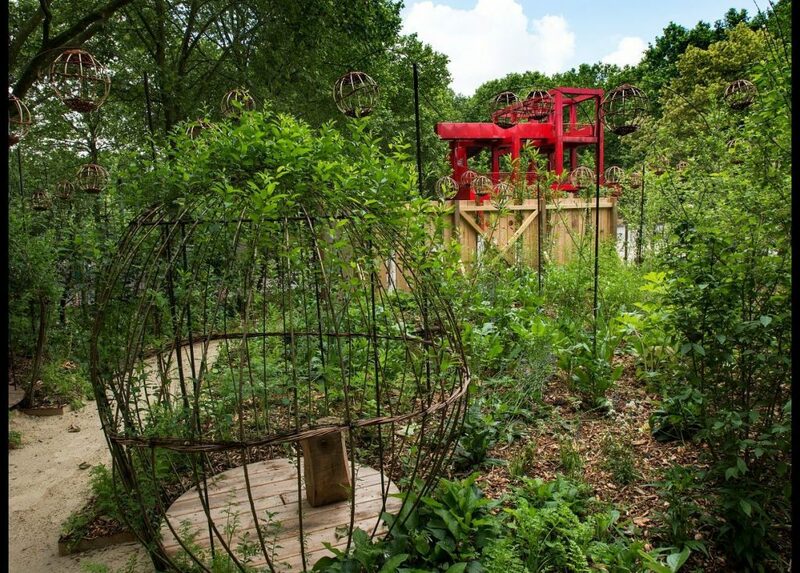 Scattered throughout the park are sculptures, red footbridges traversing the park and connecting one area to another, and “folies”– red metal structures offering additional activities and services (information desks, lookout points, and even a terraced cafe). On the whole, the gardens amount to a truly odd yet interesting feat of postmodern architecture. Yet they feel accessible and whimsical rather than forbidding. Entrance to all the thematic gardens and “folies” is free, and they’re open daily. Access: Porte de la Villette, Metro Line 7. This enormous center dedicated to scientific discovery and exploration is the city’s most recent science and industry museum, and Europe’s largest at an astounding 1.6 million square feet of exhibition space. This allows the Cité des Sciences to run several fascinating exhibits all at once, on an eclectic variety of themes. Kids of all ages (including toddlers) can make genuine discoveries in interactive exhibits that cover everything from astronomy and space exploration to genetics, marine biology, aviation and and locomotion. 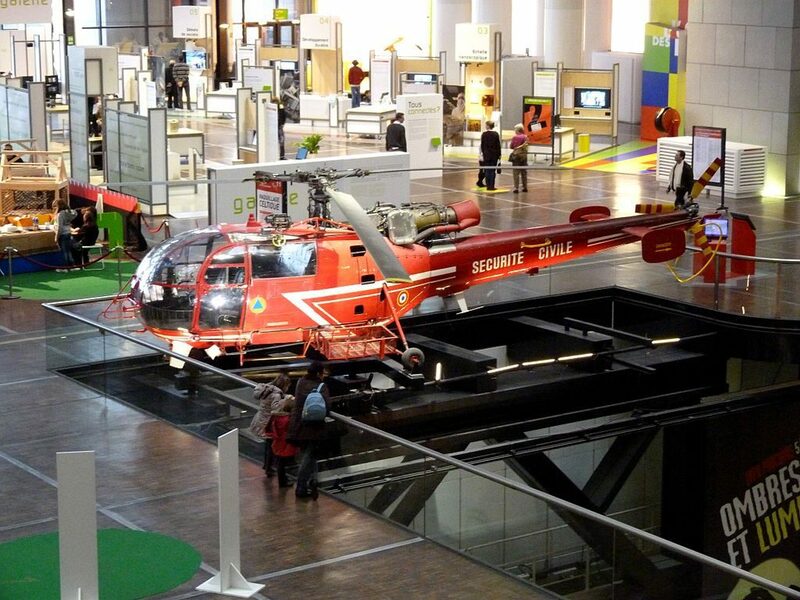 There are special demonstrations and 90-minute workshops for kids aged 2-7 in the section called the”Cité des Enfants”, generally every 20 minutes or so. See this page for more info. The permanent exhibition includes an aquarium, Planetarium, “Argonaute” submarine, and a 3D cinema named after Louis Lumière, one of the first inventors of moving pictures. Built on the site of a former livestock market , the Cité opened in 1986 with an ambitious design from architect Adrien Fainsilber. The building itself is something of a modern feat, with its impossibly high ceilings, huge windows and interior courtyard areas curated by botanists and landscape artists. Getting There: To access the Cité des Sciences, get off at Metro Porte de la Villette (line 7), enter the park and follow the signs to the museum. You’ll have to descend a series of steep stairs to get there, then enter an enormous hall to purchase tickets. 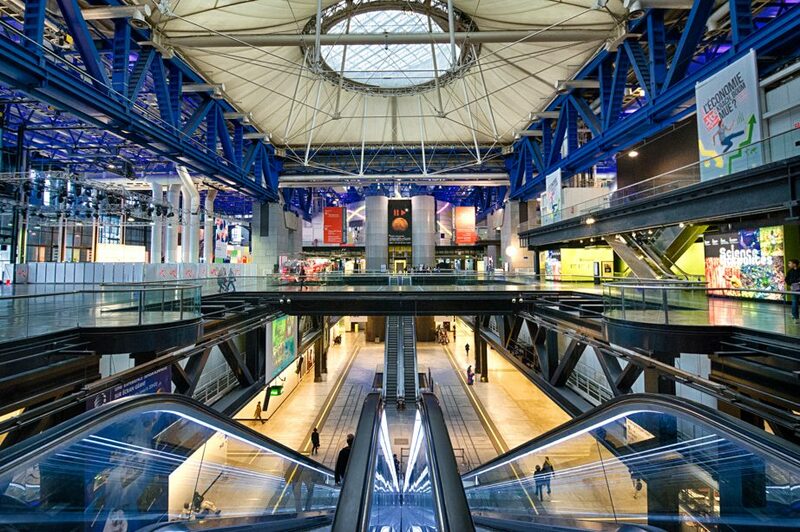 Opening Times: The Cité des Sciences is open from 10 am to 6 pm, Tuesday to Saturday, and from 10 am to 7 pm on Sunday. Closed on Mondays and on January 1st, May 1st, and December 25th. 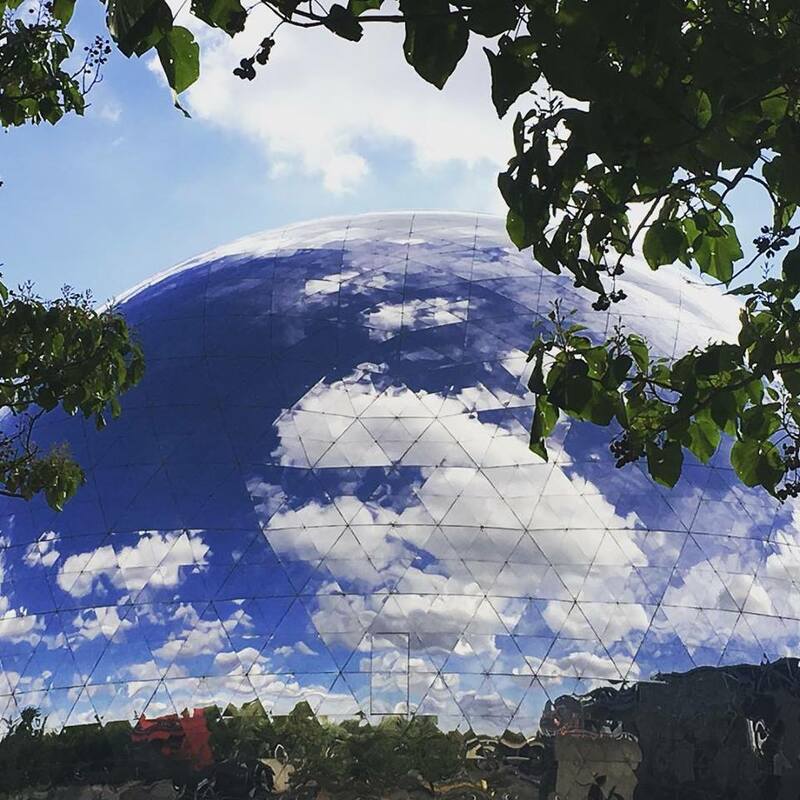 Plan your visit: You can book skip-the-line tickets to the Cité des Sciences here (via Tiqets.com). Places like Montreal are famous for their geodesic domes, built by the likes of utopian architect and futurist Buckminster Fuller during the 1960s and 1970s. 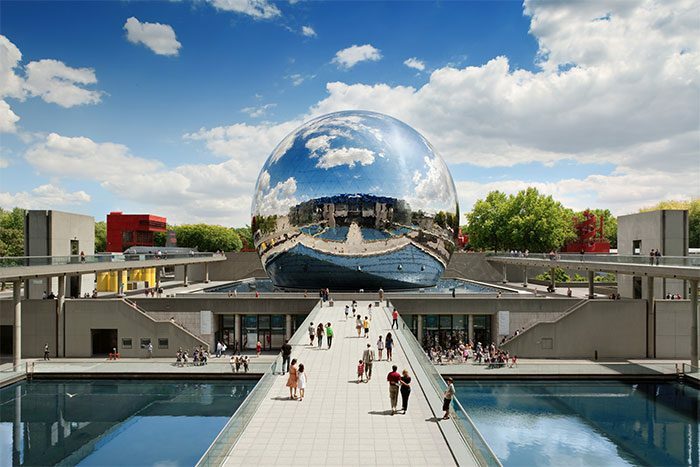 But few know that Paris harbors one of its own, nestled within the Parc de la Villette and built by Adrien Fainsilber in 1985, as part of the Cité des Sciences complex. The awesome mirrored dome is made from over 6,400 triangular pieces of stainless inox steel and boasts a diameter that’s equivalent to the height of a 12-story building. It’s a pure throwback to the utopian optimism of the 1960s, when theorists like Fuller envisaged a world vastly improved by technological solutions. Maybe we need more of that bold optimism now, and the Geode oddly embodies it. And if viewing it from afar or up-close isn’t interesting enough, there’s also an IMAX theatre inside that seats 400 people. Even on a rainy day, this is a fascinating place to spend an afternoon. Getting there: 28 Avenue Corentin Cariou, 19th arrondissement/Metro Corentin Coriou or Porte de la Villette. The cinema and dome are located next to the entrance of the Science and Industry Museum. NOTE: The cinema is currently closed for renovations, until sometime in 2020. The dome itself can still be enjoyed and photographed from the exterior. 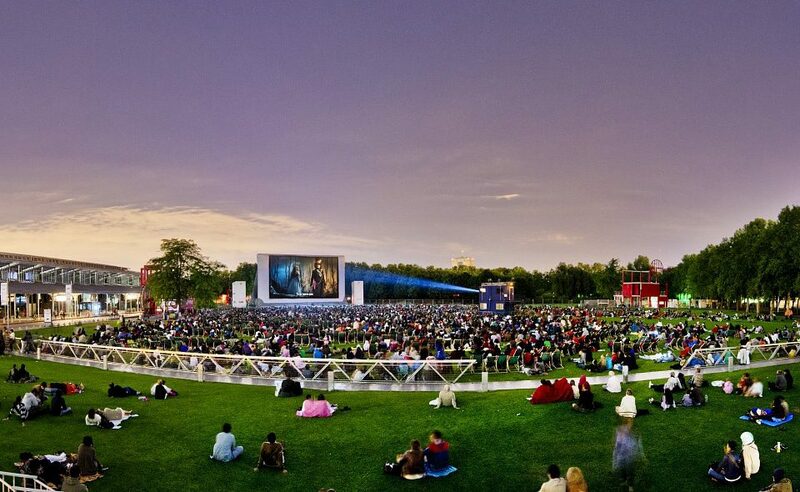 If you’re a film fan and planning to visit Paris in July or August, a trip up to the Villette may well be in order. Every year, a giant screen is set up on one of the sprawling lawns of the park, and cinephiles enjoy open-air movies most nights of the week. There’s a specific theme each year, and the program generally includes an interesting balance of old films, cult classics and newer movies. Even better: the event is totally free. Sprawl out with a picnic and enjoy old and new films alike (there are generally dozens programmed each year). The detailed program is usually announced sometime in the spring: check the monthly calendars at Paris Unlocked in May or June for an update on this year’s event. 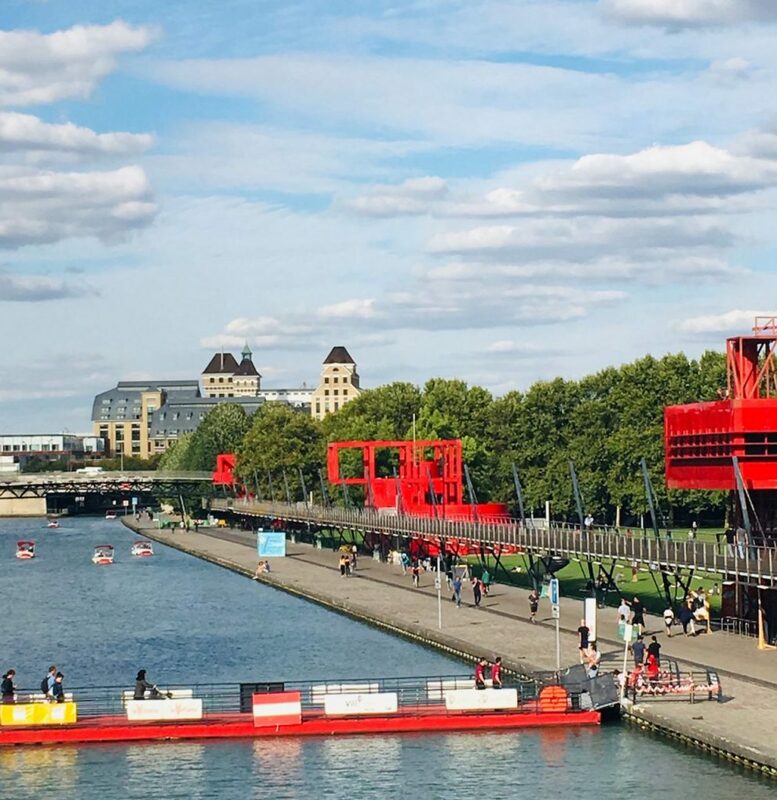 The Parc de la Villette has long harbored several interesting sites dedicated to music: the Zenith concert hall, where popular bands from around the band regularly play, and a museum consecrated to the history, traditions and future of music. 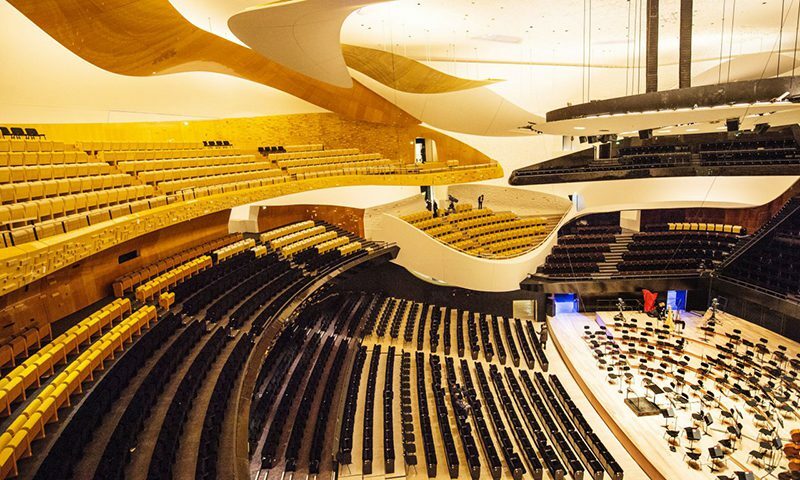 But with the opening of the Paris Philharmonic on the site in 2015, it’s become a vastly more important place for music lovers in the French capital. 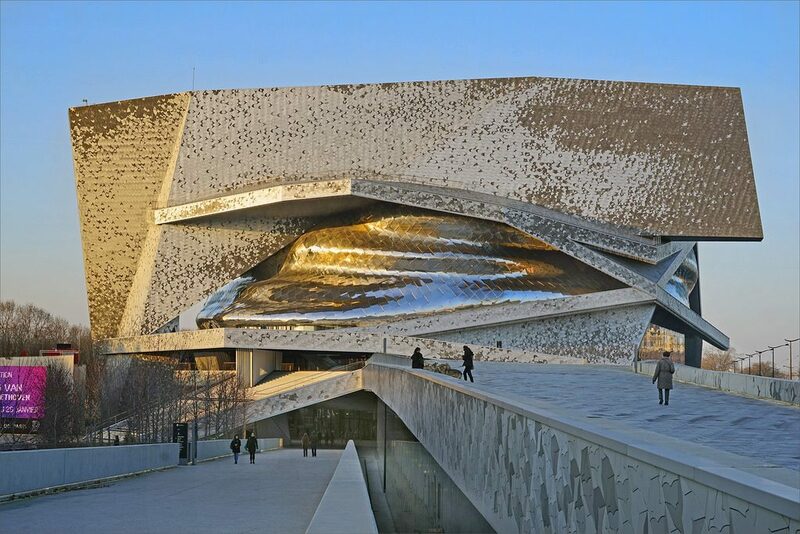 Housed in an oddly fascinating building designed by French architect Jean Nouvel, the Philharmonic has become as popular with photographers wishing to capture its oddly beautiful angles and mysteriously organic, shadowy surface patterns as it has with concert-goers. The Cité continues to hold temporary exhibits on various genres and periods in music history, and there are concerts on a nearly daily basis. You can see a full program for the Paris Philharmonic/Cité de la Musique here, and one for the Zenith concert hall here (in French only). Getting There: Porte de Pantin (Line 5) is the closest metro station to the Philharmonic and the Zenith, but you can also get off at Porte de la Villette (line 7) and walk for a few minutes, following signs within the park or with the aid of Google Maps. The Cité des Sciences isn’t the only family-friendly attraction at the park. There’s a permanent carnival of sorts set up in the middle section of the complex, featuring rides for kids of all ages (and a few more suitable for teens and adults). Vendors peddle treats including crepes, ice cream, popcorn and cotton candy, and there’s a variety of fun park games, thematic and highly interactive playgrounds. 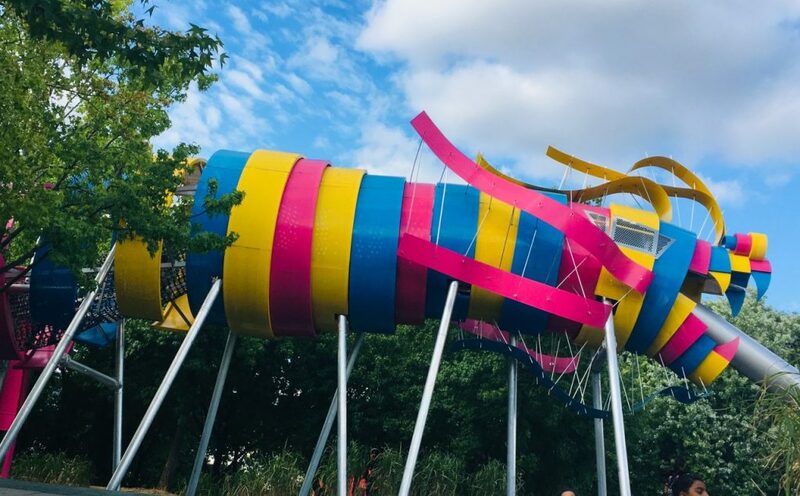 One big hit with young visitors is an enormous slide in the “Dragon Garden” that to me resembles an alien insect in bright hues of blue, yellow and pink, the slide its creepy proboscis. Never mind. The kids adore it. 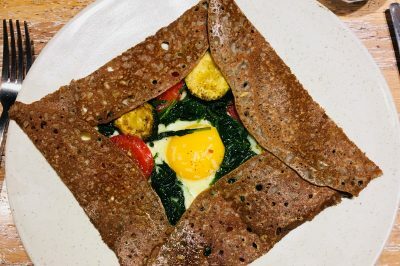 In short, if you’re looking for a way to keep your young family member happy and distracted, this is yet another reason to bring them up to La Villette. It’s arguably a more educational– and far less expensive– alternative to a day at Disneyland Paris. The park is built around the Canal de l’Ourq, a body of water that feeds into the Bassin de la Villette, Paris’ largest artificial lake. The Bassin and the adjoining canal area is an interesting place to explore by foot or bike, even as you move southward and leave the park entirely. I’d describe its banks as a new center of cultural vibrancy in Paris. Why? 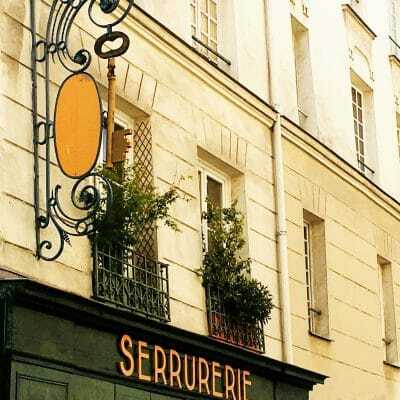 It’s lined with charming péniches (boat-bars and restaurants), sidewalk cafes and bistrots, trendy new breweries and concept bars, including one in a redecorated old house where patrons can sit in vintage bathtubs to enjoy their drinks. The last time I was there, I took several summery walks along the banks, stopping in for drinks with friends on various péniches and watching people row lazily down the canal on rented vessels. The Peniche Demoiselle is a boat-bar (“péniche) on the right bank of the Bassin de la Villette, not far from the entrance to the park. Image: Courtney Traub/All rights reserved. And the warm months, dozens if not hundreds of people perched at the waterside to picnic, sip beers and socialize. This amounts to a remarkable transformation of an area of the city that was once moribund, and even notorious as a place where drug dealers and gangs liked to operate. Luckily, that’s a thing of the past. Read related: Yes, It’s Still Safe to Travel to Paris. Here’s How to Stay Secure. In July and August, the area is taken over with a full-fledged beach operation called Paris Plages— and it’s entirely free to lounge on the banks or the pop-up bars, swim in pop-up pools installed on the water, or just take a stroll. The lake, which looks more like a river or canal at all but its widest points, stretches southward to Metro Stalingrad and Jaures. 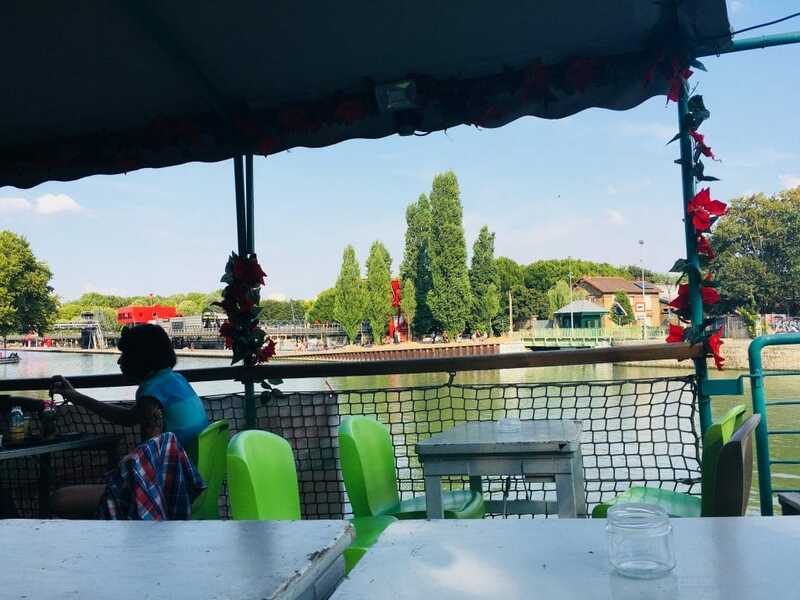 Here, two cinemas, the MK2 Quai de Seine and MK2 Quai de Loire, offer plenty to do on an afternoon or evening in the area. Several cafés, restaurants and rooftop bars are packed on the weekends and during the summer. The cinemas themselves regularly screen English-language movies in “VO” (original version with French subtitles), so don’t be shy about giving them a try. And the nearby 104 (Cent Quatre) Arts Center is one of the city’s most interesting places for contemporary art and exhibits. It’s also got a fantastic terrace and pizza truck. In short, the park is a gateway to an area of Paris that’s both incredibly vibrant and largely unknown to tourists. 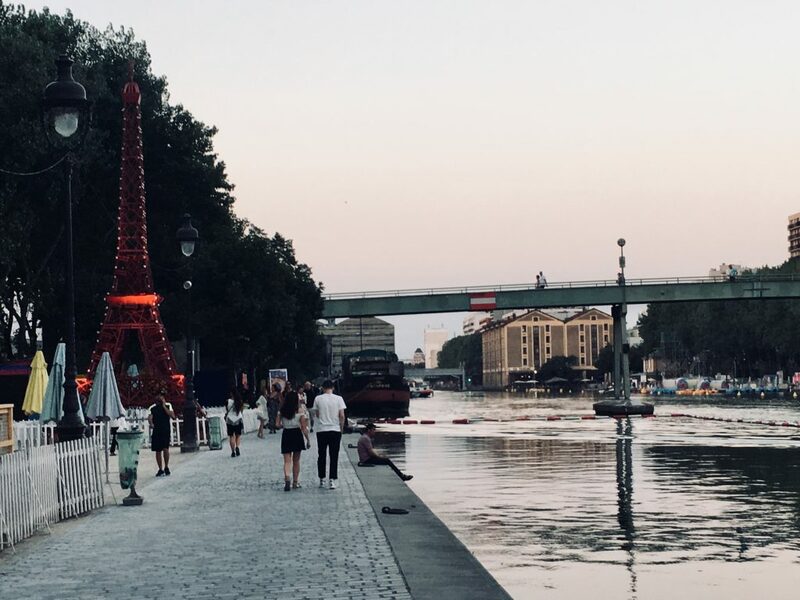 Don’t look for Parisians flocking to the banks of the Seine these days: most of them are up at the Canal de L’Ourq and La Villette. 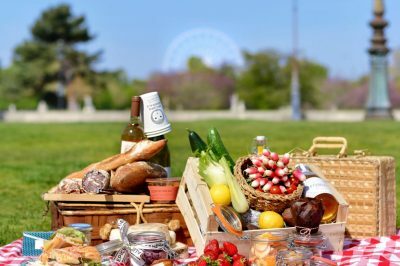 To visit the park, the easiest way from the city center is to take Metro Line 7 from the Chatelet station to Porte de la Villette stop, then follow directions to the park entrance. There’s another entrance not far from the Porte de Pantin metro stop (line 5), which may be a better bet if you’re headed straight for the Paris Philharmonic or the Cité de Musique. 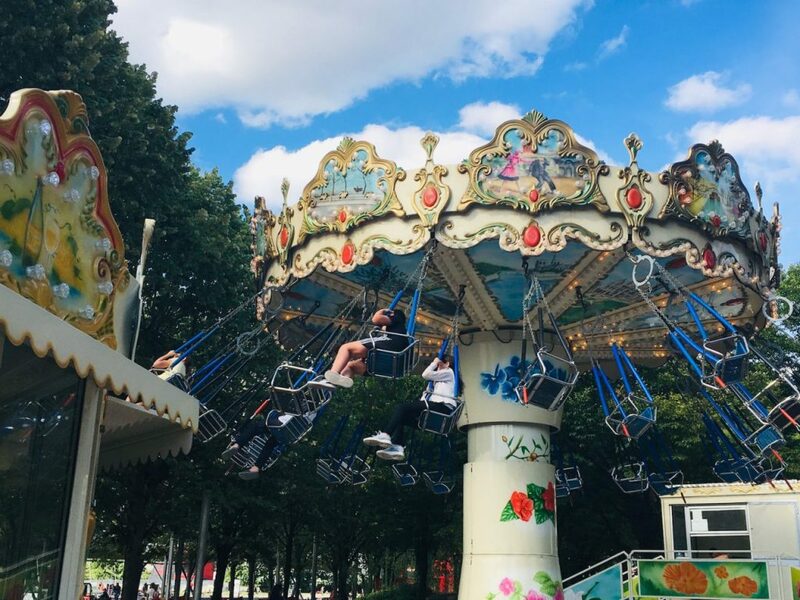 The Parc de la Villette is open from 6:00 am 1:00 am during most times of the year. It closes in the case of storms or dangerous weather. The park is enormous, and it can feel a bit difficult to orient yourself once there. Onsite maps can help, and I also recommend enlisting apps such as Google Maps to figure out where you are in the park. If so, a bit of advanced planning can only make your sojourn go more smoothly. Search for deals on flights and hotels (via Skyscanner), or book train tickets and passes (at Rail Europe). Visit this site for a wide variety of tours, river cruises, and skip-the-line passes for major sights and attractions. There’s also a good selection of popular activities to choose from at Tiqets.com. Finally, if you’re interested in a guided tour, check out The Paris Guy for a range of quirky city tours led by expert docents. Enter the promocode PARISUNLOCKED at checkout to get 5% off the listed price of any tour there. 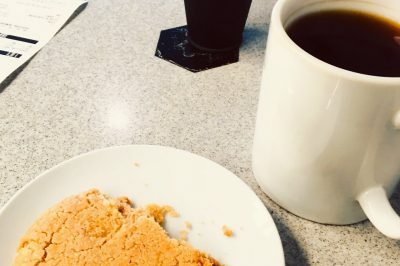 Note from the editor: This post includes a few affiliate links. If you book products or services through these, it comes at no additional cost to you– but helps fund more free content at this site. Thank you.